Is it just a text or is it more? The terms SMS and MMS come up all the time when discussing text messaging, but you may not know what they mean. This article provides an overview of the two technologies and information about how they're used on the iPhone. While this article is really designed to explain how they're used on the iPhone, all phones use the same SMS and MMS technology, so what you learn in this article applies generally to other cellphones and smartphones, too. Standard SMSes are limited to 160 characters per message, including spaces. The SMS standard was defined in the 1980s as part of the GSM (Global System for Mobile Communications) standards, which were the basis of cellphone networks for many years. Every iPhone model can send SMS text messages. On early models of the iPhone, that was done using a built-in app called Text. That app was later replaced by a similar app called Messages, which is still used today. The original Text app only supported sending standard text-based SMSes. That meant that it could not send images, videos, or audio. The lack of multimedia messaging on the first-generation iPhone was a point of criticism for that phone because other phones already had that feature. Some people argued that the device should have had those features from its debut. Later models with different versions of the operating system gained the ability to send multimedia messages. We'll cover that in more detail in the MMS section later in this article. If you want to go really deep into the history and technology of SMS, Wikipedia's SMS article is a great resource. To learn about the non-Apple SMS and MMS apps that you can get for the iPhone, check out 9 Free iPhone & iPod touch Texting Apps. SMS messages are sent through phone company networks. iMessages are sent between iOS devices and Macs through Apple's servers, bypassing the phone company. SMS messages are only sent over cellular networks. iMessages can be sent over cellular networks or Wi-Fi. SMS messages are not encrypted, while iMessages are protected with end-to-end encryption. This means that they can't be intercepted and read by third parties like phone companies, employers, or law enforcement agencies. For more on digital privacy and security, read Things To Do on Your iPhone to Stop Government Spying. IMessages can only be sent from and to iOS devices and Macs. They're represented in the Messages app with blue word balloons. SMS sent to and from non-Apple devices, such as Android phones, don't use iMessage and are shown using green word balloons. IMessage was originally designed to allow iOS users to send each other SMSes without using their monthly allotment of text messages. Phone companies generally now offer unlimited text messages, but iMessage offers other features, like encryption, read-receipts, and apps and stickers. Technically, there actually is one way to use iMessage on Android, if you have the right software. Learn all about it in iMessage For Android: How to Get It And Use It. MMS, aka multimedia messaging service, allows cellphone and smartphone users to send each other messages with images, videos, and more. The service is based on SMS, but adds those features to it. Standard MMS messages can support videos of up to 40 seconds in length, single images or slideshows, and audio clips. Using MMS, the iPhone can send audio files, ringtones, contact details, photos, videos, and other data to any other phone with a text messaging plan. Whether the recipient's phone can play those files depends on that phone's software and capabilities. Files sent via MMS count against both the sender's and the recipient's monthly data limits in their phone service plans. MMS for the iPhone was announced in June 2009 as part of iOS 3. It debuted in the United States on Sept. 25, 2009. MMS had been available on the iPhone in other countries for months before that. AT&T, which was the only iPhone carrier in the U.S. at the time, delayed introducing the feature due to concerns over the load it would place on the company's data network. 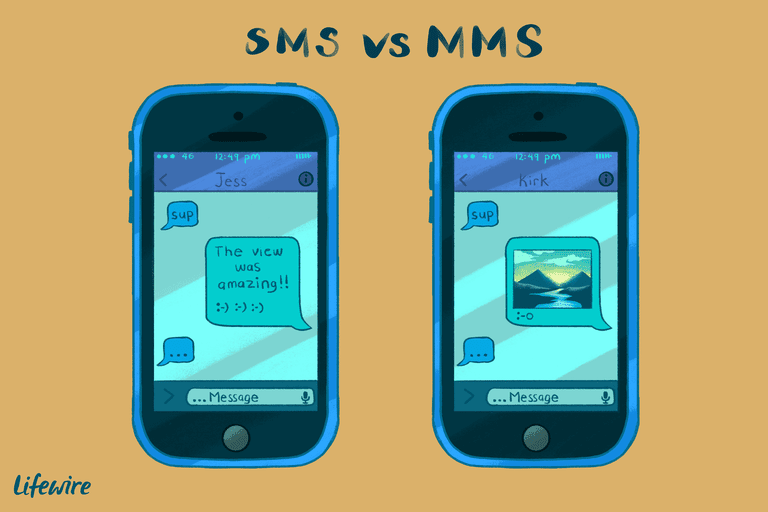 There are two ways to send an MMS on the iPhone. First, in the Messages app the user can tap the camera icon next to the text-input area and either take a photo or video or select an existing one to send. Second, users can begin with the file they want to send and tap the sharing box. In apps that support sharing using Messages, the user can tap the Messages button. This sends the file to the iPhone's Messages app where it can be sent via MMS.